Republican Gov. Rick Scott is tied with incumbent Democratic Sen. Bill Nelson among likely voters in the race for U.S. Senate in Florida, according to a new poll. 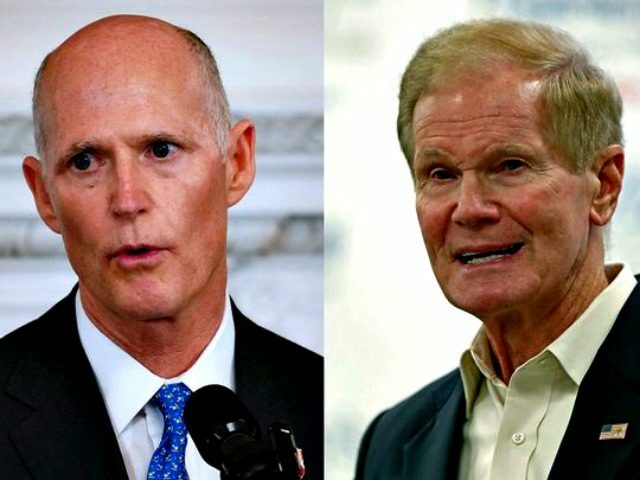 Scott and Nelson both garner 46 percent support among likely voters, including those who have cast ballots already, according to CBS News’ Battleground Tracker Poll. The poll was fielded between October 23-26. Only six percent say they’re not sure. Scott received approval from 63 percent of likely voters on how he handled the response to the recent hurricanes in Florida. Scott ranked higher than Nelson on whether likely voters consider their past experience a positive thing. Forty-seven percent thought Scott’s past experience was positive, versus 43 percent for Nelson, the state’s current senior senator. Scott benefits from Republicans reporting that they are more likely to vote than Democrats who have not already, according to CBS News. The last poll, a statewide St. Petersburg survey, also showed close numbers, with Scott with a 0.3 percent lead over Nelson. Forty-eight-point-six percent of likely Florida voters stated they would support Rick Scott in the general election in November, while 48.3 percent say they will support Bill Nelson. Bill Nelson was one of 48 Democrats to vote against the confirmation of Judge Brett Kavanaugh to the Supreme Court of the United States. Republicans are favored to hold the Senate.